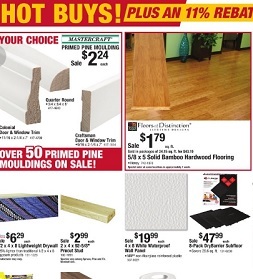 Find the Menards weekly ad sale, valid January 28 – February 3, 2018: $2.24 Mastercraft 9/16″ x 2-1/4″ x 7 ft Primed Pine Mission Casing E2E; $1.79 sq.ft. Floors of Distinction 5/8″ x 5″ Honey Bamboo Solid Hardwood Flooring (24.15 sq.ft/ctn); $3.99 GreenWatt 65W Equivalent Dimmable Warm White BR30 LED Flood Light Bulb – 2 Pack; $6.29 1/2 x 4 x 8 Lightweight Drywall(Actual Size 0.485″x48″x96″); $2.99 2 x 4 x 92-5/8″ Pre-Cut Stud Construction/Framing Lumber(Actual Size 1-1/2″ x 3-1/2″ x 92-5/8″); $19.99 NRP 0.09″ x 4′ x 8′ White Waterproof Interior Wall Panel; $17.97 Pittsburgh Paints & Stains Ultra White Interior Latex Ceiling Paint – 1 gal. ; 2/$9 Nature’s Own Country Mix Wild Bird Food – 20 lb; $3.99 Dakota 5/8″ x 7-3/4″ W x 2′ L Prefinished Square Edge Shelf; $7.99 Comfort Zone 1,500 Watt Portable Fan Heater with Thermostat; $1.99 Presto 13 Gallon Tall Kitchen Flap Top Trash Bags – 30 Count; $7.87 Peak Global Lifetime Antifreeze + Coolant 50/50 Prediluted; $31.98 Dutch Boy Platinum Plus Ceiling Interior 100% Acrylic Flat Paint + Primer – 1 gal. ; $7.29 Varathane Premium Wood Stain – 1 qt; $14.99 Lifesaver Battery Powered Carbon Monoxide Alarm; $6.99 Bronze LED Cover Light; and more.